Exercises will be of similar scale as last year, Pentagon says Annual U. -South Korea military exercises will start on April 1, the Pentagon said, in a move that risks irking North Korea. The exercises on the Korean Peninsula would be of a similar scale as in previous years, the U. Department of Defense said in a statement, stressing they were routine and not in response to any North Korean provocations or the current political situation. No details were given on specifics such as whether U.
strategic assets would be deployed. The exercises had been delayed from their normal start in March as South Korean President Moon Jae-in sought to ensure a peaceful Olympics and Paralympics in his country. They come as Moon prepares for planned summit with North Korean leader Kim Jong Un next month, while U. President Donald Trump prepares for a potential meeting with Kim the following month. While North Korea has long seen the drills as provocations of war, Kim was quoted by one of Moon’s envoys to Pyongyang this month as saying he understands they must go ahead. But North Korean state media said later they were a "grave provocation aimed to deliberately deteriorate the situation of the Korean peninsula and again push it to the brink of war.
" The Foal Eagle field training exercises will involve about 11,500 U.
troops and 290,000 South Korean soldiers, while around 12,200 U.
troops and 10,000 South Korean personnel will conduct the Key Resolve 18 exercises focused on computer simulations, the Pentagon said. Last year’s drills included the deployment of the USS Carl Vinson aircraft carrier and F-35B fighter jets. The United Nations Command has notified the North Korean army on the schedule, the statement said. 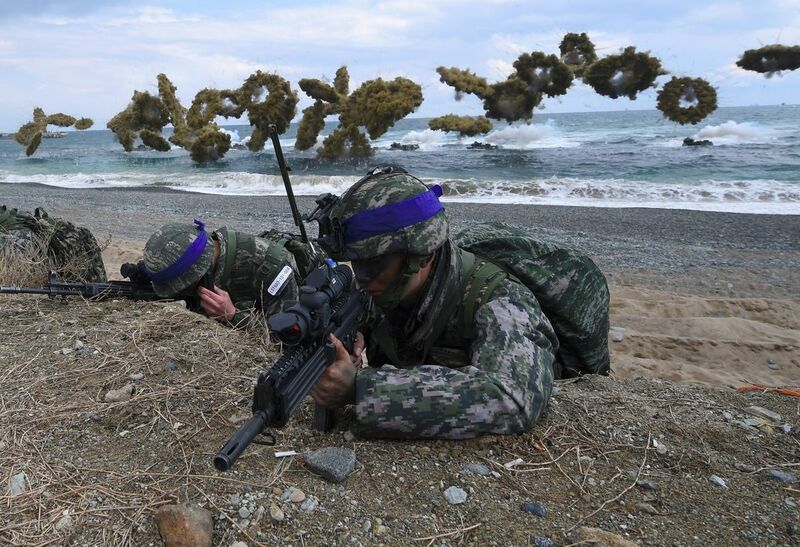 The exercises "demonstrate the Alliance’s commitment to the defense of the ROK through combined and joint training," the statement said. "They are not conducted in response to any provocations.